As diplomatic tensions again escalate between the US and Russia following the announcement of new sanctions against Moscow earlier this week by the Trump administration, Russia's prime minister Dmitry Medvedev warned the United States on Friday that Russia would regard any U.S. move to curb the activities of its banks as a declaration of economic war which it would retaliate against. "If they introduce something like a ban on banking operations or the use of any currency, we will treat it as a declaration of economic war. And we’ll have to respond to it accordingly – economically, politically, or in any other way, if required," Medvedev said during a trip to the Kamchatka region. "Our American friends should make no mistake about it," he cautioned. Medvedev also noted that Russia has a long history of surviving economic restrictions and never caved in to the pressure in the past. "Our country had been living under constant pressure through sanctions for the last hundred years," Medvedev said, accusing the US and its allies of employing sanctions to undercut global competition. "Nothing has changed." 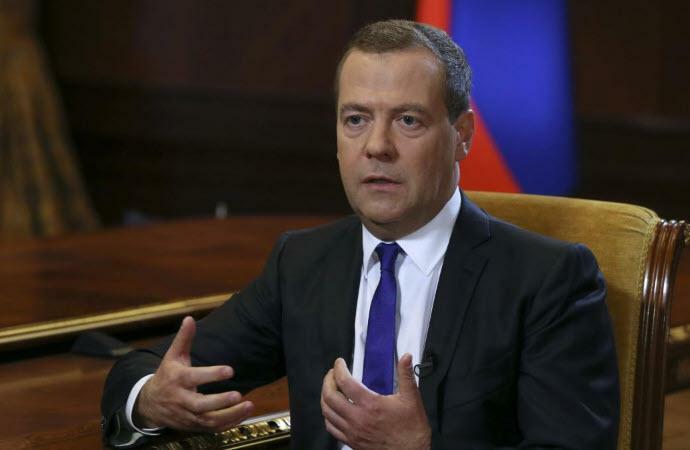 According to Reuters, Medvedev's statement reflects Russia's fears over the impact of new restrictions on its economy and assets, including the rouble which tumbled 6% of its value this week on sanctions jitters. With economists expecting the economy to grow by 1.8% this year, some fear that if new sanctions proposed by Congress and the State Department are implemented in full, growth would be almost cut to zero. Moscow’s strategy of trying to improve battered U.S.-Russia ties by attempting to build bridges with President Trump backfired after U.S. lawmakers launched a new sanctions drive last week because they fear Trump is too soft on Russia. That in turn piled pressure on Trump to show he is tough on Russia ahead of mid-term elections and the possible release of Mueller's report on Russian collusion. Commenting on the currency slide, the Russian central bank said the rouble’s fall to multi-month lows on news of new U.S. sanctions was a "natural reaction" and that it had the necessary tools to prevent any threat to financial stability. One tool it said it might use was limiting market volatility by adjusting how much foreign currency it buys. Central bank data showed on Friday it had started buying less foreign currency on Wednesday, the first day of the rouble’s slide. 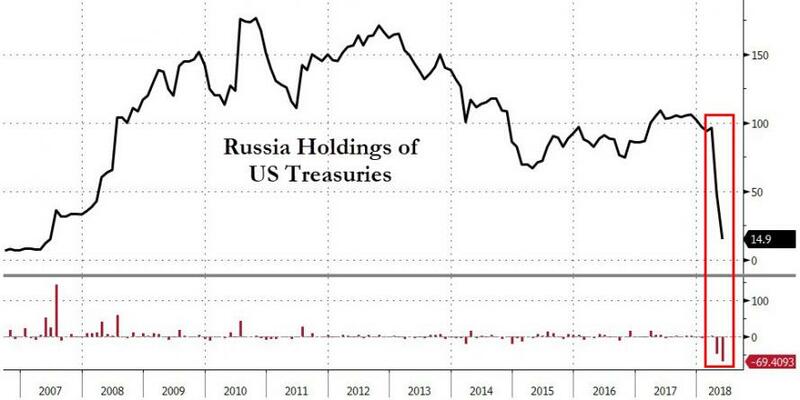 As a reminder, Russia recently liquidated the bulk of its US Treasurys holdings over the past two months as it sought to diversify away from the dollar.